You may not have time to make a berry pie, but you've got enough time to make a berry cobbler! 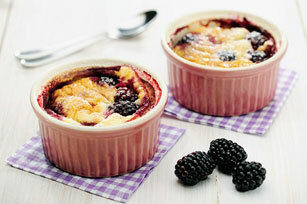 Try our recipe for Blackberry Cobblers topped with our Foolproof PHILLY Pie Crust. Combine blackberries, tapioca and 2 Tbsp. sugar in small bowl; set aside. Heat oven to 400ºF. Place dough between 2 lightly floured sheets of wax paper. Roll into 10-inch round; cut into four 3-1/2-inch rounds (discard any dough trimmings or reserve for other use). Divide fruit into 4 (150-mL) ramekins. Gently press pastry rounds over fruit. Press edges of pastry to edges of ramekins to seal. Brush each ramekin with egg yolk. Sprinkle with remaining sugar. Cut slit in each crust to let steam escape. Place ramekins on baking sheet; bake 20 to 25 min. or until golden brown. Replace blackberries with your favourite summer berries such as blueberries, raspberries or strawberries. Serve with a dollop (1 Tbsp.) of Cool Whip and a sprig of fresh mint. Wrap tightly in plastic wrap; store in freezer up to 2 months.